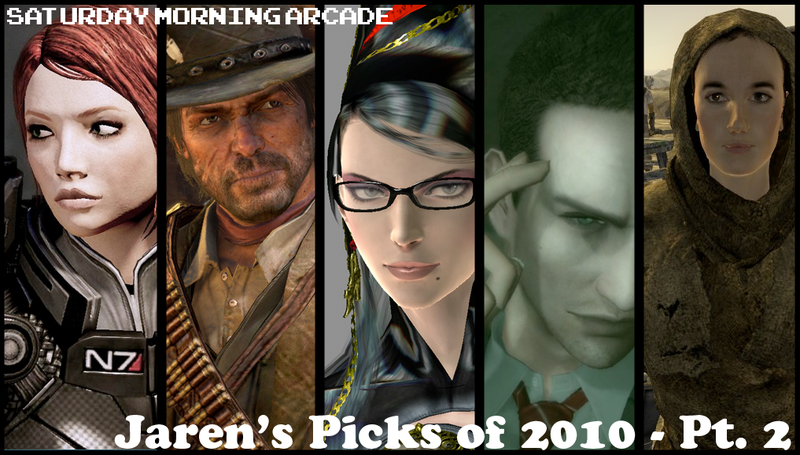 Ten days and and an awkward podcast explanation later, here it is: the exciting conclusion to my Top Ten Games of 2010. The hold up you ask? As much as I want to say school (and while that is partly true), let's just say this batch of write-ups are a little on the longer side. I hope you don't mind. Enough chit chat! These are the rest of my top 2010 titles. The phrase "Grand Theft Auto with Horses" both sums up and yet understates the experience Red Dead Redemption has to offer. While some saw Grand Theft Auto IV as Rockstar's attempt to craft a more "grown up" free roaming adventure, RDR feels like their execution of the manner. Grand Theft Auto with Horses basically explains itself. 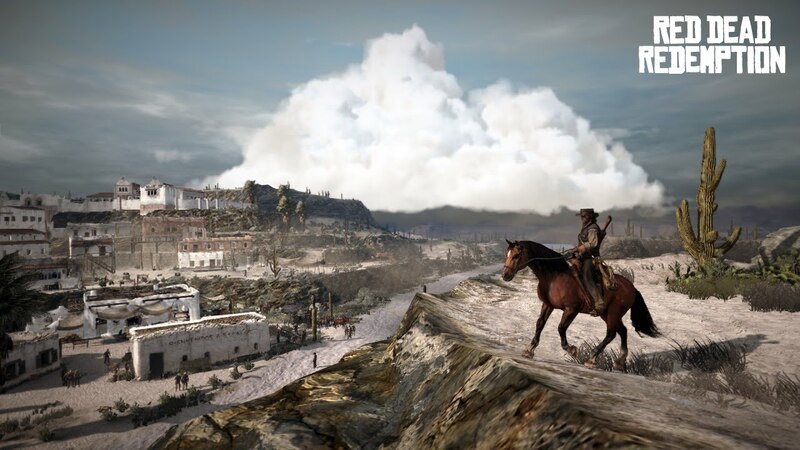 Red Dead Redemption delivers an open world, with different cities, territories and other side locations connected by roads, forests and open land. Both human pedestrians and wild animals occupy these places, helping breathe some life to your surroundings. Replacing automobiles, there are horses that you can buy, tame or steal. There's also guns. Guns that usually assist you with the problems you come across. See, it's like Grand Theft Auto. Genre fundamentals aside, it's the presentation that really shines through in this Rockstar production. Rockstar San Diego crafts the story of John Marston and his goal of doing whatever it takes to be reunited with his family. His journey guides the player throughout the wild west, and introduces them to the same caliber of characters and events expected from the company. Whether it was apart of the main story, or simply a side quest, the people Marston meets all offer something different that calls attention towards them. It was Marston himself however, that really stole the show for me. Not only was his voice actor fitting, but it was the small things that he does throughout the game that I appreciated. The fact that John Marston flat out refused prostitutes was refreshing to me, as silly as it sounds. He was the first freeroam protagonist from Rockstar that felt morally good, as morally good as a gun slinging murderer can be, and was committed to his family and the goal he set out to accomplish. The way his story wraps up may be hard to swallow during, but the ending itself is not only satisfying but makes everything worth it. While I have such high praises for this title, for a couple of weeks, I just didn't feel compelled to play it at all. Elements that I found intriguing when I began the game suddenly were no longer clicking. Traveling long distances became a chore in between the horse control, the bare setting and the repeating random pedestrian encounters. Story missions not triggering because I wasn't there at the appropriate time were certainly a joy kill. Even until the very last moments of the game, I still couldn't wrap my head around the duelling mechanic. But mostly, my issue with freeroaming games in general began to show: the setting felt less alive as the story progressed and more of a hub world to direct me to the next mission. Regardless, the story alone was what kept me going when I decided to pick it back up, one whose ending is probably one of the best endings I've ever experienced from a videogame. It was the game that gained quite the cult following this year. 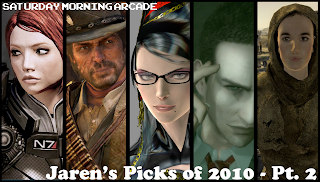 Interests piqued by Destructoid's Jim Sterling, and sold by the Giant Bomb Endurance Run, Deadly Premonition somehow non ironically became one of my favourite games of 2010. I wrote a review of sorts after I finished it, and whatever should be written here and be read there. It's true, design wise this is a terrible game. Many of the gameplay elements it presents is clunky and at times feels awkward to play. The game after all was released initially as a budget title, and everything from the visuals to the mechanics illustrates this. I cannot stress how not fun the chase sequences were to play. I really have to note that. But Deadly Premonition, in all its faults, delivered something that made that $20 pricepoint worth it. While it lacks in production, the story it tells is satisfying, and there's something special about the characters it presents. Something I can honestly say that some full price titles did not leave me with this year. This game is stupid and yet it oozes with charm. The story itself begins somewhat normal yet takes an unbelievable turn for the bizarre and doesn't let up. Just when you think the pace will slow down it ups the ante even more to the point where you really just need to let the game be as it is: a mess of a good time. In the end, it really was the characters that sealed the deal for me. They ranged from absurd to somewhat normal, psychotic to heroic, lovable to the most hated pieces of crap. 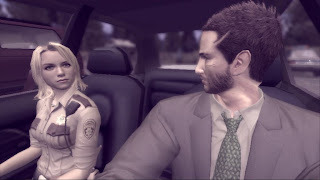 The range that's present is phenomenal when you think about it, yet they all belong to the Deadly Premonition school of nonsense. Regardless, they grew on me and I couldn't wait to see what was in store next for this misfit cast. After I wrapped the game up, I admit that I was bummed to leave this world and its inhabitants, questionable gameplay and all. I cannot stress enough that this is technically a bad game. Yet in ways it's one of those so bad it's good type of affairs, and in others it's a genuine experience worth having. I admitted on air that if I were to have played Fallout 3 during the year of its release, it would have probably trumped Fable 3 as my 2008 Game of the Year. Two years later, I want to say Fallout New Vegas accomplishes what its technical predecessor did not. 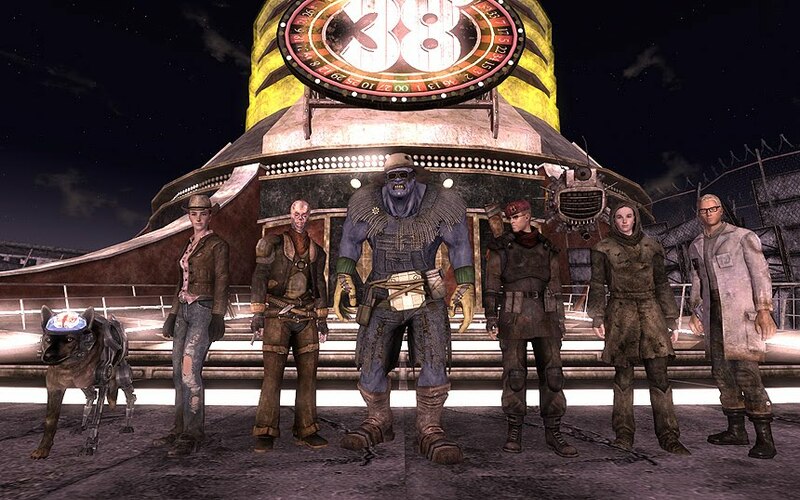 In many ways, New Vegas improves on a number of aspects presented in the franchise's "third" installment. The gunplay out of V.A.T.S feels actually competent. Social situations can more often be resolved without resorting to violence but the option is certainly there. The reputation system makes more sense than karma and adds a welcome loyalty element to things. Gameplay wise it's pretty much a more refined Fallout 3 experience. Where New Vegas really outshines its predecessor is in its story and the characters that are met along the way. An hour or two in, I felt the main quest line in the game to be more engaging, one in which I actually wanted to progress. In that progression, I ran into characters and locales each with their own stories. Stories which ranged from heartwarming to outright insane, yet were interesting enough to put the main story on hold and investigate. When you can say that you can have your fill on the sidequests alone, you know the game is doing something proper. I originally wanted to crown this my game of the year, even stating so on Saturday Morning Arcade LIVE. However, after I considered a few things and took a couple steps back (in the time of writing, I am still playing the game) I realized that while it is an engaging experience, technical issues take away from this otherwise great game. As noted beside its name, I played this game post patch. I have no real frame of reference regarding how it was upon initial release other than friend accounts and online videos. I decided to wait for a major patch to help maximize my enjoyment. Just when I thought that patch was released, after the 50 hour mark I began to experience longer loading times (some even reaching the 2 - 3 minute mark) and freezing when trying to load previous saves or enter new areas. Add in the fact that NPCs would sometimes utilize two different vocal tracks, randomly talking in one voice then address me in another, it all sort of took away from the immersion I felt in this world. After reading a few reviews upon release, it amazed me that a game supposedly this broken was still receiving high levels of praise. After finally getting my hands on the product itself, I feel the same way. While it does have some really rough edges, it's easy to invest oneself with the wasteland that Obsidian has to offer. I also have to admit, walking through The Strip for the first time was stunning. Just the way it looks in comparison to the game's other locales is really something, and that should count for something. Almost a year ago, I wrote a review for Bayonetta. Thinking back to when this game was released, it's nice to know that I was able to kick off 2010 with a bang. Though, when it comes to Bayonetta, it's more like a nuclear explosion of the senses. Bayonetta is a weird game. The story doesn't really make that much sense, and it didn't really get that much better towards the end. However, where it lacks in coherent story, it makes up for in its characters and the interactions between them. Whether it be Bayonetta, Jeanne, Rodin, Enzo, Luka or Cereza, when they are put together I felt an entertaining chemistry, especially when it came to the mother/daughter dynamic between Cereza and the game's protagonist. Though they are placed in a lackluster story, their presence is compelling enough to want to see the next cinematic character encounter between them. Sure, the game doesn't work all that well as a narrative. What it does do well is a presentation of an outrageous over-the-top style and that is done exceptionally. I cannot begin to describe how much fun I had playing this game. 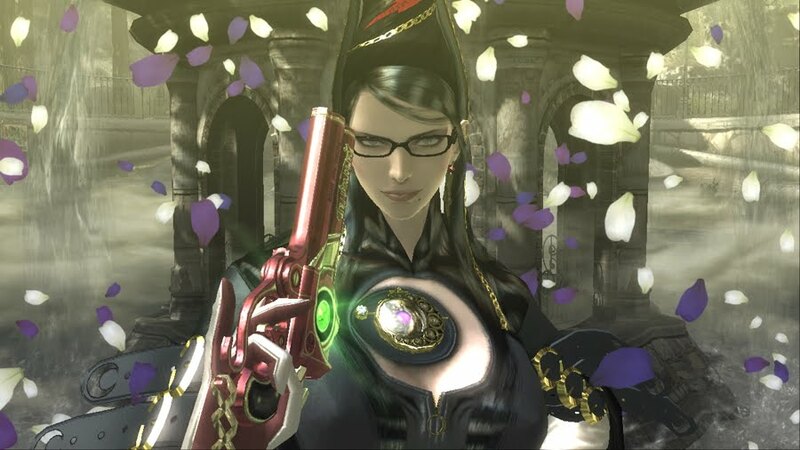 Though I was never good with the Devil May Cry style of action gameplay, it feels more digestible in Bayonetta. Even the simpler attack combos feel satisfying, and before you know it you're pulling off things even more visually stimulating. While I said Scott Pilgrim simply felt good playing, Bayonetta simply feels great. Its combat is handled exceptionally well, and looks excellent in motion. You are given an arsenal of different moves and weapons for you to play around with, making experimenting with different combinations half the fun. Add in dodging enemy attacks at the right moment to slow down time only to unleash a combo, and you really do feel like a badass while playing. 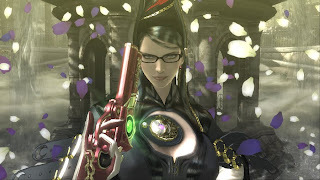 Bayonetta helped reintroduce me to arcade sensibilities, where I was playing the game strictly for its genuinely fun gameplay and a need to constantly improve my scores, to constantly improve my chapter rantings. Wrap it all up in a package complete with likable characters, weird yet fitting enemy design, a variety of homages to other games and probably the best action gameplay the genre has seen and you have an experience unlike anything else this year. Definitely, in some respects, game of the year material. I admit, I played the first and second installments of Bioware's space adventure last year back to back. While there were gameplay elements I enjoyed throughout the first one, it was the story that pushed me through some of the more rough elements (as well as Jennifer Hale's amazing vocal work - Femshep is the best Shep). Moving right to the sequel, I became much more indulged in the universe. Not only was the story more compelling, but the gameplay was refined to the tenfold. While visually, player customization did take some hits. There was a significant drop in the number of guns and armor that could be used by the player. What was given in terms of customization became less desirable as it became a matter of choosing to wear ugly headpieces in the name of boosting stats. Really, would only having headwear visible in combat and not during the conversations been so hard? Shallow aesthetics aside, Mass Effect 2 certainly delivers on all fronts. The combat is more satisfying, fairing more competent than most dedicated third person shooters on the market. But gunplay plays a secondary role to the stories being told throughout the game. As soon as you begin recruiting squad members, the story takes a shift of sorts. No longer is this really Shepard's story, but the story of everyone he meets. They're certainly compelling and in ways are more than enough reason to postpone your galactic mission. Finally, it was the choices that were imported from the first game that became the icing on the cake. It was a feature not only promoted by Bioware but also executed very well. The mix of new and familiar faces not only add a bit of nostalgia but also a unique freshness to this game. It was nice to be reunited with characters and choices from its predecessor which overall did make the story feel that much grander. While being the second entry in the trilogy, ME2 left me with a need to play the third one, a need far more evident than anything I was left with from the first. Mass Effect definitely deserves its praise as even though it was released so early on in the year, the impression it leaves is certainly a lasting one.